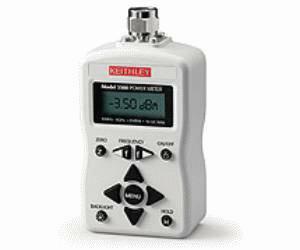 The Keithley Model 3500 Portable RF Power Meter is a compact, handheld instrument designed for making RF power measurements conveniently in both field and R&D lab environments. In laboratory applications, the Model 3500 is a low cost RF power datalogger, transferring data through its built-in USB interface to a computer for trend or drift analysis. The Model 3500 is also useful for field applications, because its compact size lets it fit into a toolkit, so it can go just about anywhere easily. The sensor is built into the handheld enclosure, so users do not have to carry both an instrument and a separate sensor module.